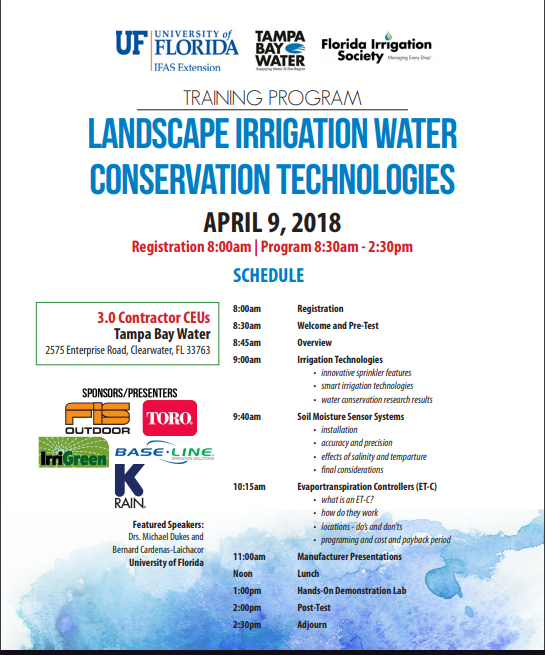 April is Water Conservation Month in Florida. A large part of using water efficiently day to day includes outdoor water-use. 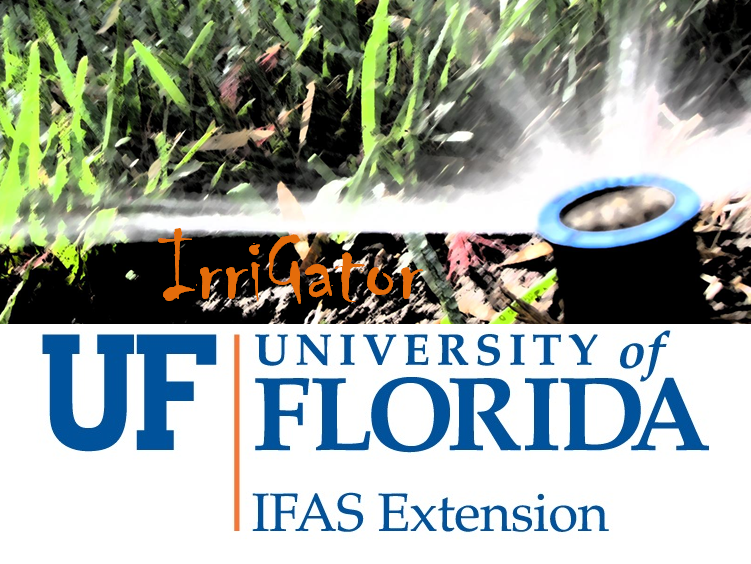 Next week UF-ABE Professor and Extension Specialist Dr. Michael Dukes is participating in an irrigation technology training in collaboration with Tampa Bay Water and Florida Irrigation Society. Dr. Dukes’ team is usually involved in several of these technology trainings every year. To mark the initial event of 2018, he agreed to answer three preview questions for IrriGator. What is exciting right now in the world of smart irrigation technology? MD: There are many options. There are over 800 models of weather-based (evapotranspiration, ET) controllers that have the EPA WaterSense label. 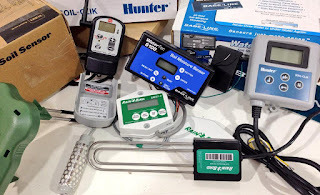 Soil moisture sensor (SMS) based controllers don’t yet have a label but there are several of those on the market as well. Exciting new developments are that many ET controllers have remote connectivity. Some are completely controlled by your smartphone. These devices offer many features. Unfortunately, most haven’t been tested in Florida and I understand from field reports that not all are adapted to our climate with intense local rainfall. We always recommend some sort of on-site rain sensor such as an expanding disk rain sensor. I often find practicioners view weather-based and soil sensor-based irrigation technology as rival options. How do you address this perspective? MD: They can be seen this way, but each have their place. I believe the advantage of the SMS is that it integrates rainfall to control the system. Not all ET systems do this well (see previous comment). On the other hand for a one sensor SMS system, the location of the SMS is critical since it controls whether the system irrigates or not. Your group does several trainings like this during the year, what can an attendee expect at the April event? MD: We’ll review how smart controllers work, both ET and SMS, and why water conservation is important, and some things to be aware of on how to properly install these devices. We’ll also introduce other types of conservation devices such as pressure regulating spray heads, check valves and flow reduction - technologies such as pressure regulation that aren’t new but in the case of pressure regulation a new EPA WaterSense label is available. We are relying on vendors to present hands-on for their particular products. 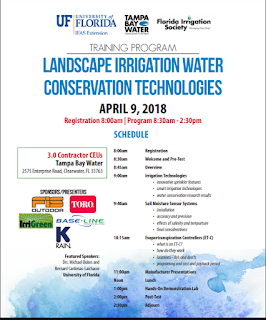 Click to register for the Landscape Irrigation Water Conservation Technologies training. Tried to register as an interested citizen. Help get informed to make a better judgement. No luck from organizer.